A funny thing happened on my way home last night. I pulled out my iPhone from the owl iPhone case to change from Noah and the Whale to Rizzle Kicks, and I nearly dropped the phone. The new plastic cover, which I love, is so slick that my phone actually slides around like a bar of soap. I caught it just in time, but I realised the method of carrying my phone like I did when it was in the Otterbox was going to have to change. Brilliant idea! I’ll make my own again. I’m afraid knit stitches just won’t have enough grip to hold the phone, so I opted for felt instead. I’d seen quite a few I liked on Etsy, but with the felt being only 29 cents, I figured I’d give making my own a shot. I’m not very good at sewing, but I do have a sewing machine and a husband who’s naturally good at sewing, which was an infuriating discovery a couple years ago. I drew out a pattern on scrap paper based on my phone and cut out the felt pieces. Somewhere along the way, I decided that a plain old grey, felt iPhone case would just be boring. 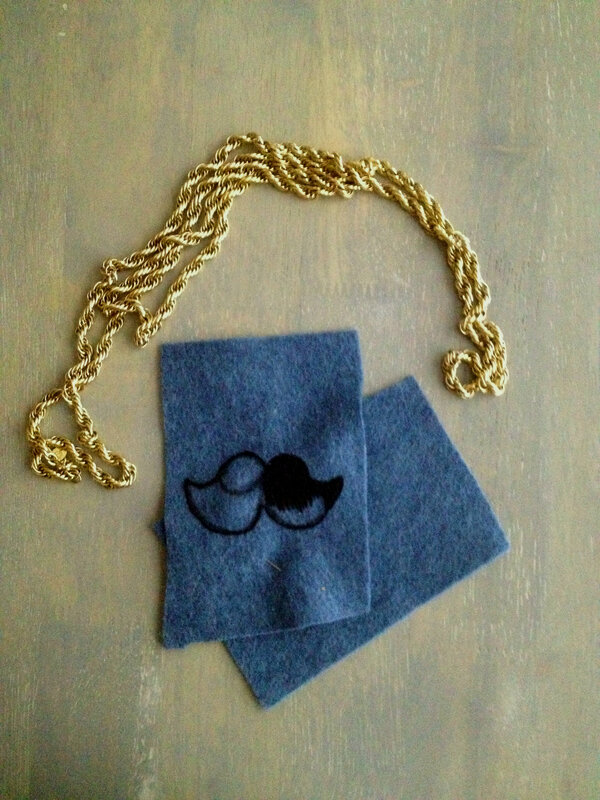 I started to embroider a moustache on it. I’m not great at embroidery, but I’m better at that than the sewing machine. I got close to halfway done last night while waiting for UPS (which never showed up and in fact said on the tracker that I had moved, but that’s a whole other story) before calling it a night. I’m also thinking of adding a vintage chain, maybe even detachable, to the case so I can wear it while walking. I’ve got plenty of vintage chains to choose from, so that’s not really an issue. I just need to find a good way to secure it so it doesn’t break. Way to procrastinate, right? I’ll probably pull out the shawl tonight and work on that instead of finishing this project. Or, I might finish this first because it won’t take as long. I’m not entirely sure. I finished The Hunger Games last night as well (Busy bee!). Not a bad book, though not a fantastic one. It took a while not to get hung-up on the grammar issues and abundance of fragment sentences. I started the next one, Catching Fire, but I’m not far into it. I’ve got a couple of other books I’d like to read too, The City & The City by China Mieville and The Diamond Age by Neal Stephenson. I read a good chunk of the latter for a science fiction class in college, but I ran out of time and never finished it. We’ll see. I might just keep going with Hunger Games until I’m all done.